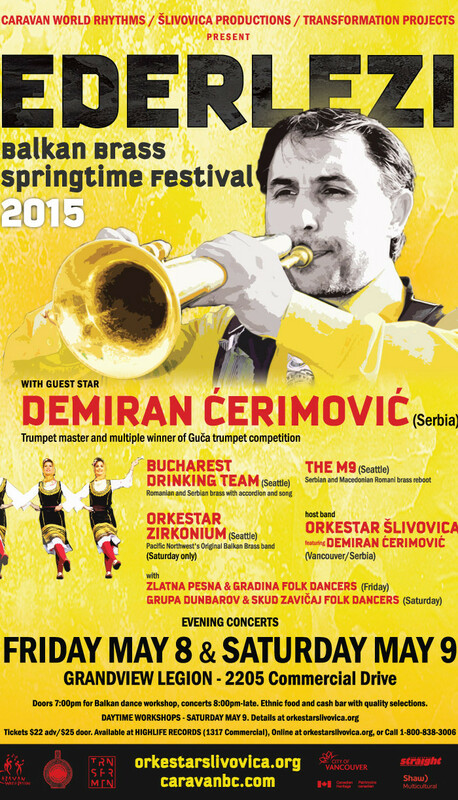 The m9 will appear Saturday evening, May 9th at the Ederlezi Balkan Brass Festival in Vancouver BC. We are honored to appear again with long-time favorites Orkestar Zirkonium, the Bucharest Drinking Team, and festival hosts Orkestar Slivovica, as well as Grupa Dunbarov and dance ensemble Skud Zavicaj. We are again excited to have the opportunity to perform with legendary Romani trumpeter Demiran Čerimovič, with whom we studied last spring. Don’t miss this annual celebration of springtime and all that comes with it. And if you are coming from Seattle or points south, check out our Ederlezi warmup on Wednesday, May 6th at the Royal Room in Seattle.